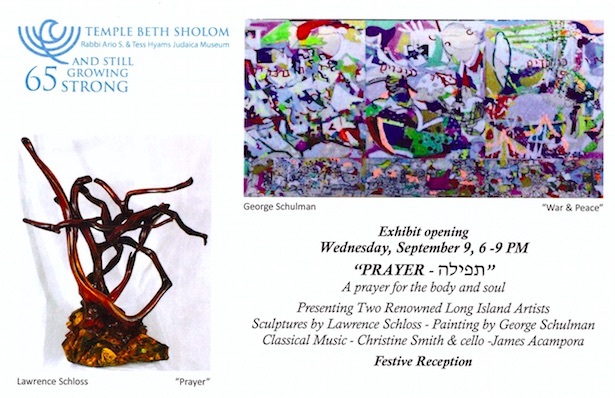 “PRAYER: a prayer for the body and soul” is an exhibit presenting two renowned Long Island Artists: sculptures by Lawrence Schloss and paintings by George Schulman. Curated by Bat-Sheva Slavin, Hyams Museum Curator. Schloss will exhibit 15 Jewish-themed stone and wood sculptures at Rabbi Hyams Judaic Museum for 3 months. He will be sharing the museum space with artist George Schulman, whose abstract paintings will be on view. This event will be the artistic highlight of the Hyams Museum for the New Year. The Hyams Museum, in Temple Beth Sholom, has numerous ancient Jewish artifacts and art.